If your house has recessed downlights with incandescent or halogen bulbs, it is better to replace the entire fitting with a dedicated LED downlight fitting, instead of just changing the bulb to an LED one. Just replacing the bulb with an LED is likely to overheat the LED and shorten its life. In addition, most older downlight fittings require generous clearances to ceiling insulation and can allow draughts through the hole in the ceiling lining. 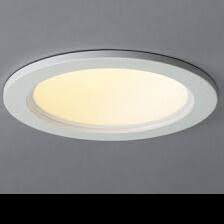 Modern dedicated LED downlight fittings combine energy efficient lighting with better airtightness and insulation can be abutted to or even laid over them. We have had all CDR's electricians do work for us over the past 5 years. They are very good electricians and great guys to deal with. The latest task was to install new LED lights in our kitchen ceiling. It's amazing what a difference this has made to the workspaces in our kitchen. We will get them back to retrofit our old 1990s downlights next year in other areas of our home. Update: We've since had the remaining 24 early 1990s downlights replaced and are really pleased with the overall result. Great advice and workmanship CDR, thank you. Smart lighting choices in your home help reduce your power bill while giving you the look and style you want. Upgrade your home lighting with LED lights. LEDs have several advantages over other lamp sources, including high efficiency and durability, and longer life. This translates into energy savings, maintenance savings and an overall reduction in cost of ownership over the product's lifetime. Lifetime of an LED is quoted in hours. Lifetime hours stated by manufacturers for residential products range from 20,000-50,000 hours. An LED will not instantly go out like traditional forms of lighting; (unless it is overheated or over voltage) it will slowly fade over time. With the estimated efficiency of most LED bulbs being between 80% and 90%. This means that of the power the LED bulb is using, 80% of that is being converted into light and only 20% is being converted into other forms of energy such as heat. Your standard incandescent bulb has an estimated efficiency of only 20% with electricity losses through heat being a huge 80%. Reduces the amount of power used for lighting by up to 70%. LED downlights are the perfect replacement for your old-fashioned downlights. They’re simple to install as they come as a sealed unit of light and fitting all-in-one. It’s generally a simple process of removing your existing light fitting and replacing it with LED. Different size cut-outs may determine the best option for replacement. Please contact us if you want our electricians to recommend a solution for you. Upgrading the lighting in your home may be more cost-effective to modernise the overall look, than other options. Long life = 20,000-50,000 hours. Energy effiiciency = Reduces the amount of power used for lighting by up to 70%. Instant light = no warmup period required. LEDs last longer = they're useful for those harder-to-reach places, no bulb changes. Will not go out instantly = light slowly fades over time. Durable quality = $ savings. Environmentally friendly = LED lights have little to no flickering and emit no back ground hum.